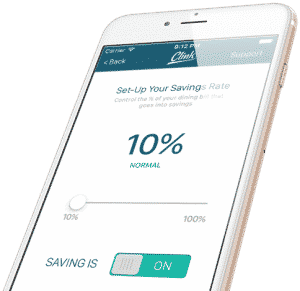 Home › Investing › Clink App Review 2019 – Microsavings Made Easy? 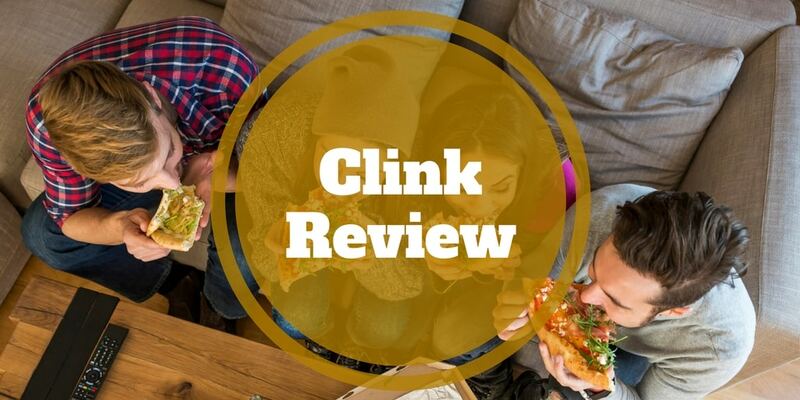 Clink App Review 2019 – Microsavings Made Easy? If you struggle to save, Clink is designed for you. Clink makes it easy to save regularly and invest automatically without having to break out a pencil and paper and create a budget. The way it works is you link your bank account to your Clink mobile app. Then you simply set a savings schedule, such as $15 per week or 10% of the price of each fast food order you purchase, and you’re set to go. Clink will automatically transfer money from your bank account to your Clink account and invest it on your behalf, so you can be hands-off when it comes to both saving and investing. Like some other popular microsavings apps, Clink costs just $1 per month up to the first $5,000 managed and 0.25% of assets under management thereafter. Is Clink Right For You? How Does Clink Invest Savings? If you find it hard to save or invest and you are fee-conscious, Clink is worth checking out. Clink was designed with Millennials in mind but the reality is anyone who wants a hands-off approach to saving and investing can benefit from the microsavings app. If you are fee-sensitive, Clink is a perfect fit because it charges low monthly fees of $1 up to the first $5,000 managed and 0.25% thereafter, which is in line with the best money-saving apps. No account minimum is stipulated either, so there is no reason not to download the app to see what all the fuss is about, and you can get started investing with as little as $5. Clink is designed as a mobile app for those on-the-go, though you can sign up and get started in a web-based browser too. Download the Clink app, link to your bank account, specify your savings preferences, and Clink invests the money on your behalf. You can also link your credit card to Clink and you can save a percentage of each dining experience. To get started with Clink, download the app from the App Store if you have an iPhone or Google Play if you use an Android device. After you set up your account, you will be asked for your social security number – a legal requirement for financial companies since the Patriot Act was enacted. Next, link your bank account so that Clink can withdraw money to be saved. You will be invited to specify how much you wish to save regularly. The minimum you can choose is $1 daily if you want continuous withdrawals to your Clink account. Or by linking your credit card to Clink, you can specify that you want to save a percentage of each dining experience. For example, each time you buy tacos, you could decide you want to save 10% of the purchase price. Once you have selected how you want to save, Clink does the rest so you can be hands-off – your savings will be invested automatically. Clink relies on Modern Portfolio Theory to invest your money into a diversified portfolio of Vanguard funds. Like most traditional financial advisors and robo-advisors who invest money on behalf of clients, Clink relies on Modern Portfolio Theory as the bedrock of its investing strategy. Modern Portfolio Theory was developed in the 1950s when “beating the stock market” was a more popular aim than building a diversified portfolio. The idea behind the approach is to maximize returns for a given level of risk. So, if you are a conservative investor, your returns will generally be lower than a risk-seeking investor who is more comfortable with larger portfolio swings. To achieve the aim of building diversified portfolios, Clink relies on Vanguard funds with low expense ratios. Vanguard is renowned for creating low-cost mutual funds and exchange-traded funds (ETFs) that prioritize clients’ interests. By charging no monthly fees and partnering with Vanguard, Clink sends a shot across the bow to rival microsavings apps, such as Acorns and Stash, that it has a customer-centric business model, which should lead to greater loyalty. >> What Are The Best Vanguard Funds? Clink costs $1 monthly up to the first $5,000 in assets managed and 0.25% thereafter. Although Clink charges a comparatively low monthly amount of just $1, keep in mind that this translates to a fairly hefty annual fee on small amounts. For example, if your balance was $1,000, then a $12 annual fee would translate to 1.2% of assets, which is more in line with traditional financial advisors than automated robo-advisors. By contrast, Betterment charges just 0.25% for a similar service level. However, once your balance reaches $5,000, the annual charge is more in line with leading low-fee robo-advisors. Clink automatically saves and invests your money in low expense ratio funds and charges low fees above $5,000 in deposits. However, you are not permitted to invest via retirement accounts nor will you enjoy advanced features provided by robo-advisors, such as tax-loss harvesting or automatic rebalancing. ✅ Low Monthly Cost: For just $1 monthly up to the first $5,000 or 0.25% thereafter, Clink automatically saves money for you and invests it on you behalf. ❌ Limited Account Types: If you have a retirement account, such as an IRA or Roth IRA, Clink does support it at this time. ✅ No Account Minimums: You don’t need to deposit a dime to open an account with Clink, however a minimum $5 is needed to get started investing. ❌ No Tax-Loss Harvesting: While many robo-advisors, such as Betterment and Wealthfront, who specialize in offering tax-loss harvesting services to boost after-tax returns, Clink does not provide this feature. ✅ Diversified Portfolio: Six exchange-traded funds feature in client portfolios and they include stock, bond, emerging market, european and inflation-protected funds. ❌ No Automatic Rebalancing: If a position in your portfolio drifts, Clink does not automatically rebalance your portfolio as some digital advisors sometimes do. ✅ Low Expense Ratio Funds: Low expense ratio funds from Vanguard are used for client portfolios. ✅ Automatic Savings: You can save automatically the cash you have in your existing bank account by setting a calendar date when transfers take place or by linking to your credit card and saving a percentage of each dining experience. ✅ Lump-Sum Investments: If you want to boost your nest-egg, you can make a lump sum deposit with a daily limit of $10,000. ✅ No Hidden Fees: ACH transfers are free and, other than a penalty fee for returned ACH transfers, no other fees beyond management fees apply. Clink uses bank level security to protect your personal information by using SSL and 256-bit encryption for mobile and web applications. Plus, any sensitive data, such as your social security number, is encrypted for maximum protection. Clink doesn’t store any of your banking information. Your credentials are only used to authenticate your identity and verify that you are who you say you are. If you link your credit card, ENVESTNET, which is a unified wealth management technology and services provider, will store its details. Although Clink is an SEC Registered Investment Advisor, it only supports taxable accounts. If you have any retirement accounts that you want automatically managed, it is best to select from a list of the best robo-advisors. Clink doesn’t support tax loss harvesting or automated account balancing strategies. 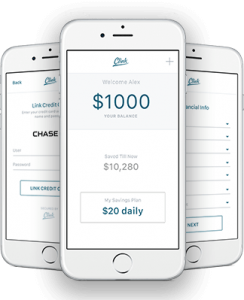 Clink is a microsavings app designed for individuals who struggle to save or want to automate saving and investing. It wins brownie points for keeping fees comparatively low and in line with rivals, featuring low expense ratio Vanguard funds in diversified portfolios, and in supporting both automated cash savings from bank accounts as well as a percentage of credit card transactions on dining experiences. Where the app gets docked marks is by catering only to taxable accounts and charging relatively high percentage fees for low account balances – though no minimum account balance is required to get started.